Here is an excellent example of classic Arts & Crafts Lighting design. Lighting By Hammerworks Arts & Crafts Wall Sconce Model ACS300 is crafted from solid copper. Add a mica shade to complete the look. We also offer a Verdigris finish for these Craftsman sconces. Most noteworthy we equip this single arm sconce with an electric socket rated for up to 60 watts. Consequently this reproduction Arts & Crafts Wall Sconce offers you a unique accent piece that creates a soft warm lighting effect. We handcraft each Craftsman Style wall sconce using hand hammered 1/8″ thick solid copper. The multifaceted texture of this Arts & Crafts Wall Sconce brings to life the eye catching Craftsman Style. Especially relevant this design goes hand in hand with the Craftsman Style Wall Sconce ACS302. 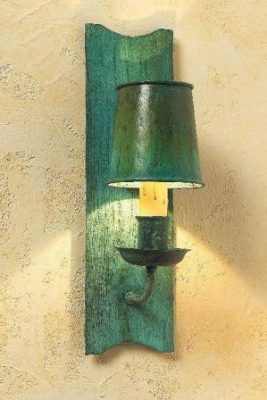 Or for a whimsical accent the Craftsman Style Copper Wall Sconce ACS304 is a perfect choice. Thus you can easily mix and match these sconces within your space. Any one of them fits right in with the hand hammered metal elements so commonly found in Arts & Crafts homes inspired by the architecture of “Frank Lloyd Wright”. Certainly if you are in need of additional overhead lighting to complement your Arts & Crafts Wall Sconce you should take a look at our Arts & Crafts Hanging & Ceiling Lights. From the striking Arts & Crafts Copper Hanging Light ACH333 to the simple lines of the Craftsman Style Ceiling Light ACCL360 we have the ideal option. Most importantly we offer the same antique copper and verdigris finish options for a uniform appearance. Also for the hanging light fixtures we supply two feet of matching chain and a ceiling canopy. Of course if you have a high ceiling and need more you can purchase additional chain for a minimal charge per foot. No matter what you can complete the design of any room with selections from our Arts & Crafts Lighting collection.